What is Taxes Less Taxing? Taxmantra.com, a pioneer in the online tax and accountancy services launches the “Taxes Less Taxing” Initiative for businesses. In the spirit of supporting businesses, this initiative would give one-to-one mentoring sessions on tax and regulatory issues that businesses face on a daily basis. These sessions would be organized across India, starting with Bangalore session this month. Some of the recent statistics available indicate that every second Start-up gets Income Tax Notice for tax demands or for non-compliance. Around three out of seven start-ups find place on the default list of Registrar of Companies due to non-compliance. Two out of Four start-ups incur unnecessary pay-out by way of interests and penalties. And nine out of 11 businesses make TDS payments with interest. The Taxes Less Taxing initiative looks to advise businesses in avoiding such issues. Specialized One to One mentoring– This is the basis on which this initiative is based. Herein business owners would be assisted with specialized one to one consultancy regarding their business issues. Basic awareness about legal health of your organizations- In this reign of tech start-ups, most is founded by guys from non-finance background. In this situation, becomes even more important to be conversant with the basic tools that secure your business. One Stop Solution for all your business queries- It is not a prudent decision for start-ups and SMEs to hire a CFO or full time accountant to do hand-holding for all regulatory issues. It also gets difficult to find a single window for all the business needs of the organization in the outsourcing model.TLTs would aim to consume this vacuum of a One Stop Solution for all business needs. Simple, Easy to Understand, Start-Up Friendly- TLTs would not stress on technical jarVgons. These would be specifically designed for start-ups. Hence, these would be simple and easy to understand. Presence in more than 100 cities of India and abroad- All local litigations and appeals in place. Authorized E-Return Intermediary by IT Department. Taxmantra Group has been in existence since the year 1983 providing tax and allied services, being pioneer in the online Tax and Accountancy practice serving over 100 cities all over India and abroad. Taxmantra is a complete client centric organization providing end to end solutions for start-ups and SMEs. The operating team consists of qualified professional like Chartered Accountants, Company Secretaries and lawyers. The clientele base consists of over 125,000 satisfied individuals, 8000 plus businesses and 5000 plus corporations as of now. Alok Patnia, CEO of Taxmantra.com has been actively involved in the start-up sector of India. He has been advising and mentoring a huge number of start-ups by providing them with necessary hand holding with regards to various issues of their businesses. These include intrinsic issues like Entity Structuring, Funding, Tax and Regulatory compliances and allied issues. He is great insights on the business starting-up and maintenance issues. He is a qualified Chartered Accountant and a commerce bachelor from St. Xavier’s College having post qualification exposure with Ernst and Young and KPMG at Bangalore. 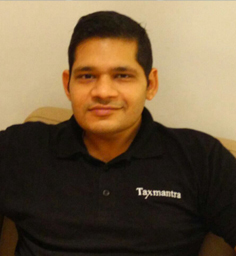 “Taxmantra.com wishes to maintain this as a stepping stone and create a strong-hold of easy business maintenance and starting up environment in India and abroad. By the end of the year 2018, Taxmantra aims to reach the door-steps of 50, 000 start-ups and make their life hassle free”, concludes Alok.